IT WAS NOT SUPPOSED TO HAPPEN LIKE THIS. THE YEAR IS 2003. Casablanca suffers terrorist attacks. Al Qaeda bombs Riyadh. GW Bush and British forces invade Iraq with the approval of pretty much no one. Saddam Hussein finds himself rolling downhill into some pretty-deep kimchi. Serena Williams beats Venus Williams in the Australian Open. Serena Williams beats Venus Williams at Wimbledon. The final “original-style” VW slips off the assembly line, in Mexico. Arnold Schwarzenegger becomes governor of California, drives a Hummer, smokes Cubanos. The world is having a bad-hair day. You know how when something happens and seems so terrible, and then it turns into something wonderful. That’s the story of Duncan. It wasn’t the safest time in history to be traveling the world. And maybe even less secure for an American to travel in the Middle East. But when the travel angels land you somewhere, you go with the flow, and pray and watch your back and call yourself a Kiwi (nobody feels the need to kill a New Zealander). It was a dark night after Lisa and I finally crossed the desert and Hajar Mountains and arrived along the shores of Oman. Oman is a fairly desolate place in between towns and cities, with no streetlights illuminating the roads. If we could not find a hotel, Lisa and I were prepared to camp on the beach because we’d just spent a week camping along the ridge of the Hajar Mountains and viewing its highest peak, Jebel Shams, and the vast canyon of Wadi Nakhr. The rugged and rocky Hajar Mountains run from the south-eastern tip of Oman, north through the United Arab Emirates, then plunge into to the Arabian Gulf at the Musandam Peninsula, which interestingly enough, although separated from the rest of Oman by the UAE, belongs to Oman (you have to love the way the Brits divide up a desert… glass houses, throwing stones, and the Bushes aside). Jebel Shams is the highest peak on the Arabian Peninsula, at something like 3,000 meters, or almost 10,000 feet. Humans have lived in the Hajar Mountains for millennia. Flint tools dating back to over 125,000 years have been found here. But we didn’t want to camp. We were tired. We were gritty. We weren’t young and lithe and dumb. We wanted a bed, a shower, and someone else to cook us dinner. We wanted a room with a view and a sea breeze. Don’t get me wrong: camping is enjoyable, invigorating even, and it grounds your spirit. But at some point, enough is enough. We were right on the cusp of enough when we happened upon Sohar, a pleasant little town fairly north in Oman’s geography and lying on the shores of the Gulf of Oman which further on, narrows into a wicked dogleg then expands into the Arabian Gulf with Iran to the north. Rumors reveal that when it was just a tiny fishing village, Sohar was the home of Sinbad the Sailor (yeah, a real person, but with a semi-real biography). One of the worst travel hassles, for me, is arriving in a new town at night and not having a place to stay. I don’t mind it during the day, I actually welcome it when there’s time to search for a room in daylight, but at night when you’re tired and it’s dark and nobody speaks English and you’re almost out of gas—not my favorite top-ten choice of experiences (Yeah, I hear you: “try making a plan, doofus”). So, we were endlessly overjoyed, and grateful, when the road happened at that moment to lead us to the Sohar Beach Hotel (thank you, thank you travel angels). The Sohar Beach Hotel is no five-star hotel. But you could smell the ocean, and it was exactly what we needed. The best thing about the Sohar Beach Hotel was its match boxes. The worst part about the Sohar Beach Hotel was they allowed smoking in the rooms. The hotel had match boxes sitting in numerous ashtrays inside the rooms. 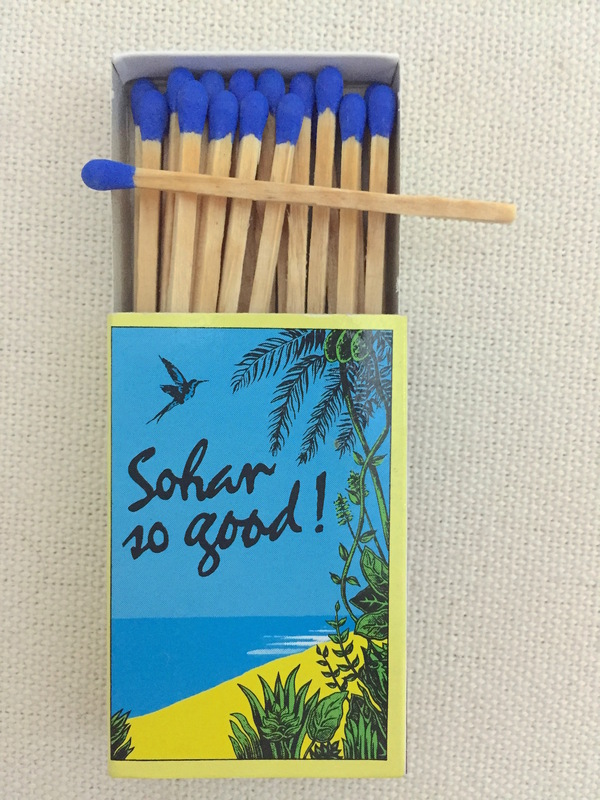 The motto written on the matchbox says: “Sohar, so good.” The matchbox displays lush plants, waves, a beach, and a long-tailed tropicbird. You can’t stay upset too long about cigarette odor with a motto like that staring you in the face, and it being true just outside the window. Like they say, take the good with the bad when traveling. We spent a few days traveling along Oman’s east coast on Highway 1. We traveled north to Fujairah in the UAE, stopping to snorkel. We traveled south, a ways past Muscat, visiting the ancient Mutrah souq, one of the oldest souqs in the Arab world where we purchased frankincense and myrrh. Our last morning, we walked along the beach collecting sea shells, just east of Wadi Jizi, where a small fresh-water creek, with its source in the Hajars, empties into the Gulf of Oman. Seeing this creek reminds me of something I read regarding “sand,” I believe written by Annie Dillard maybe. She (or whoever it was) suggests that the ocean creates no sand, that all the sand in the world is made and washed down from mountains in creeks like this or in rivers like the Amazon, Nile or Mississippi, then dumped into the ocean and washed ashore nearby, or thousands of miles away. Cheap advice du jour: don’t believe everything you read somewhere, especially if it’s a clownfish wearing sunglasses, a goatee, and a tattoo on his fin who can’t quite remember for sure where he read it. Lisa and I had collected quite a few shells, actually two good-sized plastic bags full. Even though we “thought” we’d end up at the beach and scavenge for shells, we had not brought the plastic bags with us as part of our super-efficient travel plan. We found the bags on the beach (thank you, angels). We triple-bagged them for strength. Sea shells are surprisingly heavy. Perhaps one of the best things about Omani beaches is what you can find there, like near-new plastic bags. Lisa also found an ancient hand-carved Omani door with rusted hardware, a bit beat up, but so authentic and artistic, she decided to drag it home to hang on her wall. 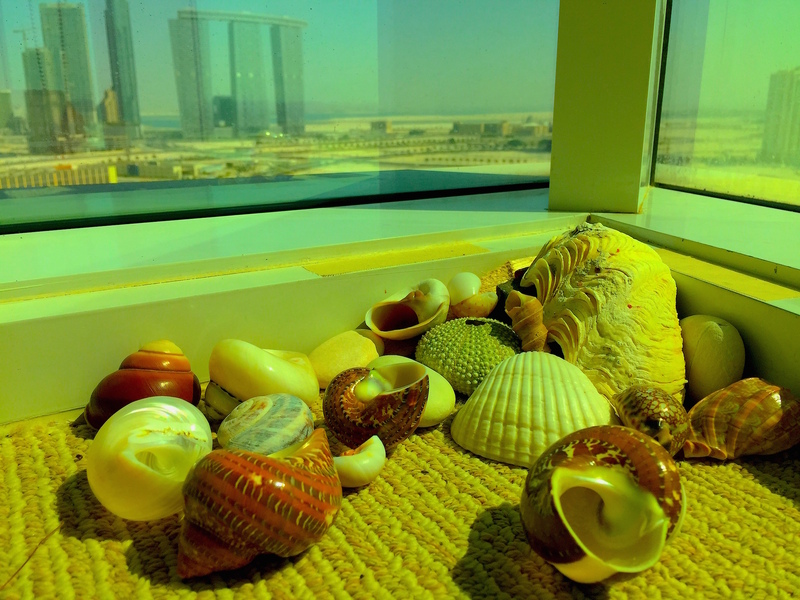 You can also find some fairly-colorful shells along the coast of the Arabian Peninsula. At one particular time of year, nautilus shells wash up and litter the sand. If you swim a ways into the water, you may encounter some of the most venomous sea snakes in the world. If you’re out surfing, you may get ripped off your board by a shark (it has happened in this part of the world). After a quick lunch of goat meat shawarmas from a roadside vendor, we headed toward Nizwa, a desert oasis in Oman renowned for its souq, its fort, and Mid-east antiques: swords, Bedouin silver jewelry, unglazed clay water jars. I have to admit here that I’m a little disappointed at this moment while writing because all my photographs of this trip, and any taken before 2006, are in 35mm slides, and I haven’t found a good photo lab in the UAE that transfers slides to digital. bleak terrain, maybe eight hours on the road if you stop to eat and photograph forts and souqs and sand dunes and water jars and sidewinders. We’ve got some Bob Seger on the stereo: “Against the Wind,” “Roll Me Away,” “Like A Rock.” Good driving music. We’re cruising at an easy 140 kph (like, 85 mph…normal for this part of the world; however, Oman recently lowered its maximum speed limit to 120, or 75mph). We hear a strange noise coming from the car. A rustling, jagged noise, behind us. Very unusual. Scary, actually, nothing you want to hear coming from your car in a desert in the middle of nowhere, who knows how far to the next oasis or service station. I turn around to see what it might be, and bust out laughing. Lisa turns to look, but she is not amused at all. She had been careful to glance inside each shell she picked up off the beach. She has a strict code of crustacean ethics. Apparently, I’m not that careful a shell scavenger. Lisa is not happy because exactly what she had been so careful to prevent happening… has happened and is sitting right there on the backseat of the Jeep. I admit, I feel a bit guilty about this. Lisa had been so careful, and I had been, well, a tad cavalier about ensuring we didn’t poach any live critters from their world and bring them home with us. So much for control. I had to hold the crab in my hands while we drove because…well, where do you put a hermit crab capable of clawing his way out of triple-plastic bags. Not in your pocket. We didn’t know how far down the road we might travel, and then luckily, again (thank you travel angels), we happened upon a hotel, newly built alongside the road just this side of Nizwa, looking vaguely like an Arabian fort painted white, and seemingly right smack dab in the middle of nowhere in this desert. But apparently, someone had done their homework and realized a hotel right there in the middle of nowhere was a good place for a hotel — for day trippers driving from Muscat to Nizwa, or further on into the UAE. The best thing about the Falaj Daris Hotel was its bidet. 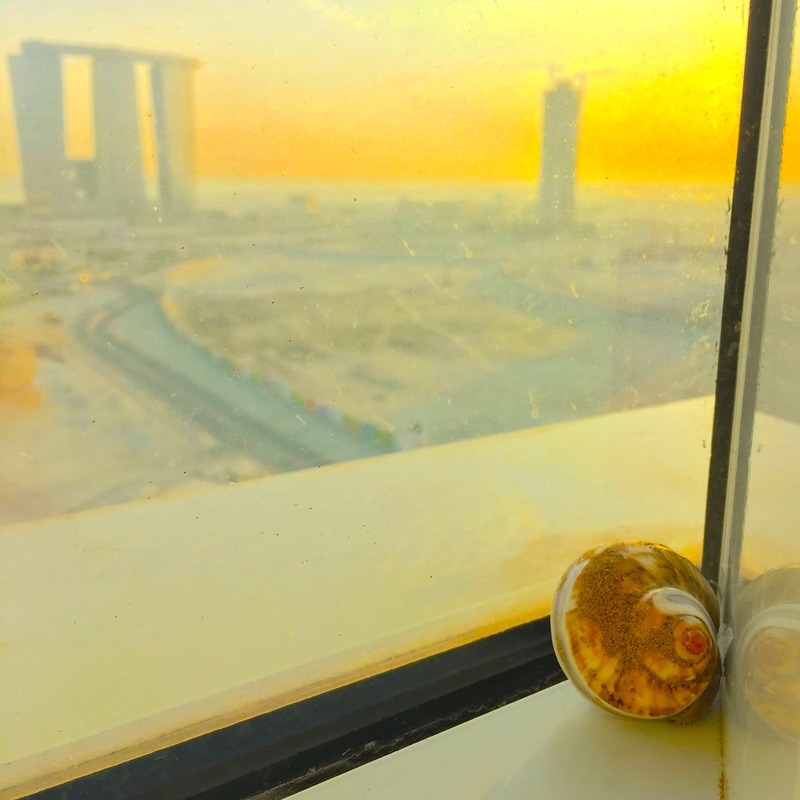 Question du jour: Where do you keep a hermit crab in your hotel room in a desert? I don’t think he liked the bidet much, but at least he had fresh water to drink (and couldn’t climb the slippery porcelain). We dumped a handful of sand and some sea shells in there to keep him company. The next morning, we found a box from the hotel to carry him in. He survived the journey and the heat of the remaining five or six hours into Abu Dhabi. That was in 2003, almost 13 years ago. Duncan has lived with me ever since. My colleague told me you had to “dunk” the crab in water to keep his body wet. You don’t. You leave a bowl of salt water for him to bathe in. You leave a bowl of fresh water to drink. But the idea to dunk him stuck. So, his name is Duncan. He eats peanut butter (crunchy or smooth), dates and other dried fruit, pita bread, coconut, spirulina, wheat grass, alfalfa sprouts, seaweed. I give him full range of my spare bedroom, the master bedroom, which I’ve turned into my home office. 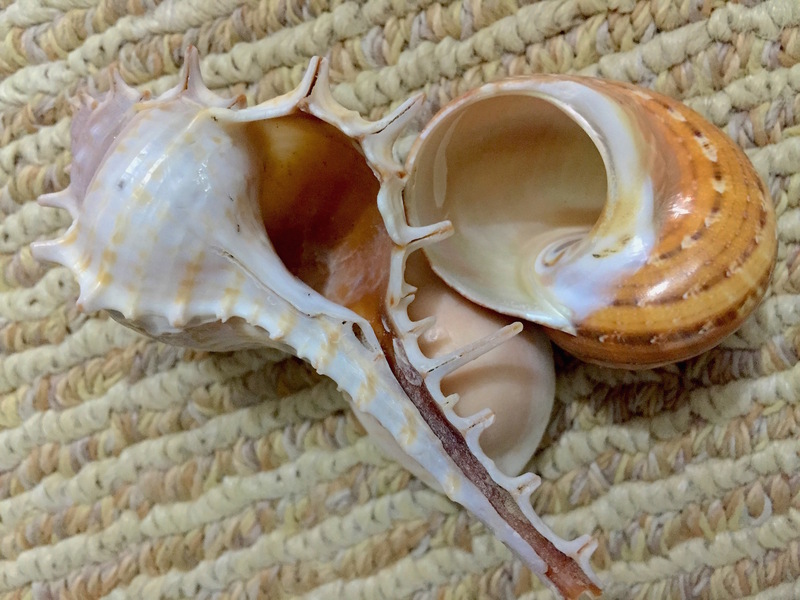 The shell on the left is his original shell from Sohar Beach. You can see how much smaller the opening is than the one on the right, which he chose from a number of shells we offered him for just this purpose. 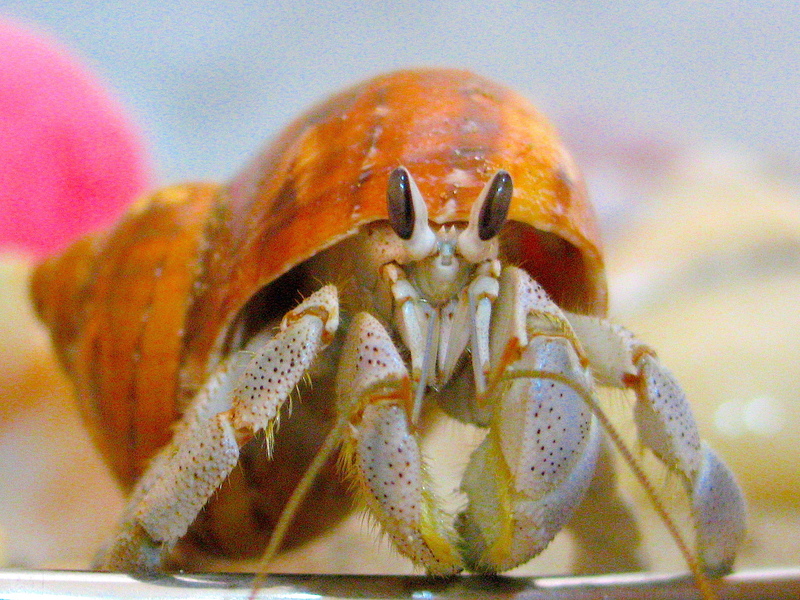 Hermit crabs change into larger shells, so they can grow. Duncan is now in his third shell, which is fairly larger than his second one on the right. He holds his shell on with tiny legs and claws located along the sides and tip of his body. I’ve only stepped on him twice. Duncan climbs up and over these shells to get to his favorite spot at the window, where he sits and ganders at the view through the glass. He still tries to claw his way through the window, has dug up the rubber seal at the bottom pretty badly, trying to dig his way out. But he’s going nowhere. Don’t tell him that, though. If there ever was a crab with determination, a will to survive, and a quirky personality (if no knowledge on the physics of “glass”), it is Duncan. When I first brought him home and put him in the office, he realized he was in a big “box” (the room) and needed to climb up and out of it. He spent a few months climbing to the top of the bookcase (the tallest object in the room) trying to reach the top of the box he thought he was in. He never bothered to climb the desk, he never climbed the chair. He understood the concept of “height” and how to get where he wanted to go. After a while, he knew enough to give that up as futile. However, he still spends hours trying to walk through the window. Some days he’ll walk right up to me and touch my foot with a claw as though saying “hey.” Other days, he shuns me, as though I were a worthless pariah. Other days, he sits under my chair looking up at me as I sit at my desk. Other days, he shrinks from me as though I were a dangerous predator. Other days, he stares at me from across the room, takes a step forward, then two back. I never quite know what he thinks, or what he’ll do or how he’ll react. Some days, he sits in the palm of my hand as though it were a comfortable chair. Other days, he rushes away from my palm as though fearful. What is such a “treat” is not that I found him. Nor that he has lived so long, just shy of 13 years. Nor the fact that Lisa has also come to love him (we have a joint-custody agreement). Nor that he is so easy to care for. And cheap to feed…he is VERY small. His poop is miniscule, and always solid, easily vacuumed with a Dust Buster. What is such a treat is that I can so easily sneak in a line here about poop, with impunity. Sohar, so good. Yeah, he is one tenacious little guy. I don’t know if he’s happy. But he is safer…which might not make him happy at all. And crabs are social, so he must miss his buddies, and a good woman. I thought about covering up the glass, so he couldn’t see out, so he’d stop attempting to walk through glass. But then, I thought it one, gives him something to do, and two, keeps him exercising and fit and strong. And really…how many of us are truly happy with where we are in life? But I still feel bad. On the other hand, I fear if I put him back in the wild now, he might not be able to fend for himself. Anyhow Badfish, I am still somewhat sombered by your victory post, so i’ll just add in a humble little plea. I would really love to read the post about Duncan and his Magical Hat, pretty please…. could you make it this weekend? You’ve mentioned it numerous times, so you really wanna write it…. you say you don’t know HOW to write it? Oh come on, Badfish ….You never know HOW to write a post( youve said so yourself) you just DO it and it always turns out brilliant. So just WRITE it, okay, dont think about it….. So please, the post, Baddie, the one about the Magical Hermit Crab and his Fish-in-disguise-as-a-human-captor/owner/best friend …. 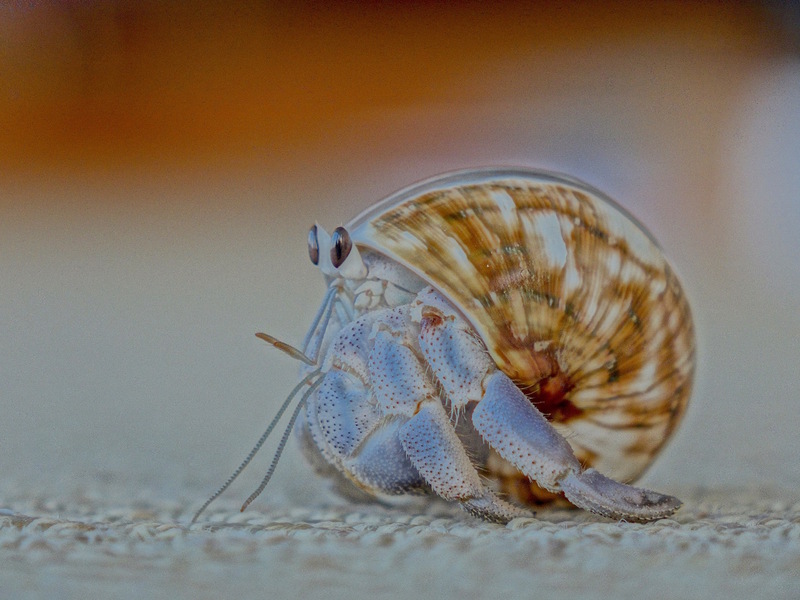 I am now rethinking my position on hermit crabs as pets. My daughter will be thrilled. Beautiful photos and I love the stories. Thanks for stopping by my blog so that I could find yours! Well, with a title like Dirt Road Wife, who wouldn’t want to stop in to see what was going on there!! To be honest, they may not be such a good pet. They are very fragile, especially in a child’s hand. Well, I just finished this, and went to look for a picture I took to show you another coincidence, and as things lately often do, it disappeared. I’d begun this with something akin to feeling that I’ve stepped into an alternate universe, the one where there are simply the echoes of what was just beyond the thin membrane separating the real post and comments from here. There’s so much to say here. I’ve found that pretty much is the way of it when I come here, and have settled in next to my fireplace (imaginary), my legs hanging over my overstuffed chair. Hot tea, or Hot cider, piping hot, with a cinamon stick jutting out. I’m grooving along listening to your trials and tribulations of being the kind of traveler who truly wins the gold ring, because, seriously, planning… Not so much. Why? Because, if for some reason a person has gone through a whole hullabaloo to set up a trip, and some situation pops up, that’s just not going away, and suddenly, not only have you not gone on your trip, but have had to spend money even though you never set foot out the door… Whatever happened to taking chances? You, my fishy hero, are the one, in whose footsteps I want to walk. All that aside, the real prize, is FINALLY I get to hear Duncan’s story!!! I remember him from the early days of visiting your blog. But, here, he’s the star of the show! Poop and all! I love that little guy, and now, I have the story! So, do you talk to him? I mean, when you have such a captive audience, wouldn’t you? Heck, I’m conversing with my two newest spiders; a mother daughter team, who recently took up residence in my bathroom. I have a front row seat to the Spider Academy. It’s not only excellent, but quite educational. I’d have added a picture of my own Duncan like shell, but it seems I’ll have to try again when there is light outside, so I can see it. What are the odds? Well whatever they are, I don’t care. I love the connection. I can only wonder if you too have a brain rock. Fim, you are such a treat, especially for me this early in the morning (where it’s late at night where you are). My question is this: why don’t you get yourself one of those cast iron stoves so you can actually have fire? I’m thinking of installing one in my motorhome once I return to the real world. Gotta have a fire with piping hot drinks with cinnamon sticks sticking out of them, eh? And yeah, I talk to him all the time. I even call into him if I’m just passing by the office in the hall…to let him know I’m here. Sometimes, he’ll come over to the entrance (which I have blocked by a piece of wood he can’t climb), and you know he’s wondering just what is out there. He knows it’s the way in and out. Actually, we have a fireplace downstairs, in the frigid dungeons. It needs to be re-furbished. Not to mention that there’s all manner of crap piled up in front of it, that fills the entire space between the hearth and the other side of the room. It’s left over stuff to still be gone through after our move. YAY@ conversations with Duncan. You could probably get a tv series of your own on that one! Would be almost willing to get TV for it. I look forward to stories about your mobile home with cast iron stove. Ciao my friend… until next time. better than a ‘trick’…why whatever COULD you mean? They make a tiny stove that can go in a motorhome, or boat!!! Ah ha! I knew it…. 121 thoughts on this, and they’re gone, vanished without trace. Another WP trick or treat? what do you mean…gone…like in disappeared gone? yikes. I wonder if it would be better to create your own blog…but that seems like soooooo much work. maybe better to put up with the weird stuff here? Strangely enough, when I came over to finally finish posting for this story, everything was gone, on the comments front. My first thought was, Wow, I’m the first. But, how could that be… Last is more like it. I like to sit with your words, savor them, think on them, jot down my thoughts, and that sometimes means I’m running to catch the train as it pulls out of the station. It was, I’m sure, a WP glitch, but it was one weird moment. I thought briefly that you’d pulled up stakes and became that true Bedouin I know lives in your heart! Heading out into the world, going where the wind takes you, where the trails are barely noticeable, and where you have gone in search of that Rice Field of which Dreams are made. So I’m happy to know that you’re still here, and that I can bring food for thought, as you do for us all! I think something very sinister is up with my site. Many people I follow simply were not on my reader! I had to refollow them. WP had no answer. Now the REader is acting like it has ADD, can’t remember what to do. But yeah…Bedouin in my heart!! Wind at my back. Hahaha, Kiss my app, hilarious. I don´t know what the thing about planning a trip. Or having a guide. I don´t do either. I don´t want to know what I´ll be doing in months! Yeah…who wants to know what’s going to happen and then be disappointed when it doesn’t? And a guide…no way, they just get in the way and take you to stores where they get kickbacks. Oh my goodness- long live Duncan! What a great read. I’m going to follow you back 🙂 Glad you stopped by mine so I found yours! Hey, cool. Welcome. Thanks for visiting and commenting. And I’m glad I found yours! I’m new here and like your blog very much. It’s always filled with warmth, love and honesty and nothing short of inspiration. Keep it up. Thank you so much. Kah Choon…Welcome aboard, and thank you very much for stopping by and hanging out a while, and commenting. I am so glad you find my blog interesting!! I have just found this post- brilliant, hope Duncan survives! I had had a hermit crab called Attila for several months, marched into my life on Kite beach… a really tenacious little explorer, but sadly passed on after an aquarium fail…never found one quite like him since! Vicky…Duncan seems to be doing just fine, he just came up from molting once again (he spent 6 weeks under the sand). They do have their own characters.